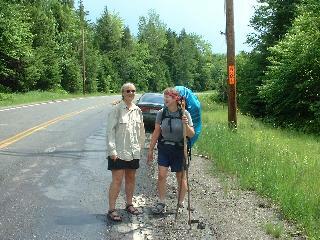 While Judy was hiking the second day, a guy stopped his car along the road and asked if she was hiking the International Appalachian Trail. When she said "yes", he replied that he had just dropped his girlfriend off at the beginning and that she was a day behind her. The next day we saw her along the road and stopped to introduce ourselves. Her name is Darcy and she is a chiropractor from Wisconsin. I have seen her every day someplace. 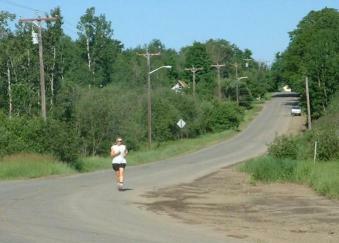 She may catch up if Judy takes a day off when I go to Bangor to pick-up the tires for the Saturn that I ordered. Some days it rains and some days she runs part of the way, but Katahdyn is always in the background. 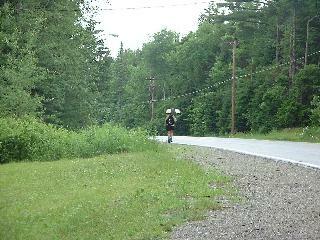 The road (and the trail) follow the Penobscot River for a few miles. 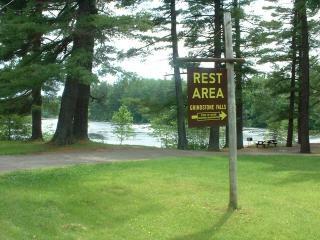 This is a rest area next to Grindstone Falls( behind the sign). They are about 6" tall. Some falls !!! 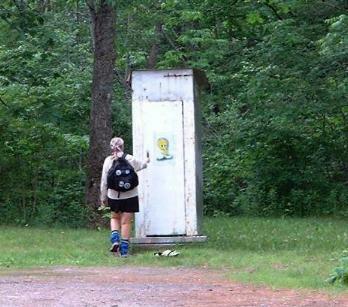 But they had a "Tweety Bird" Outhouse. 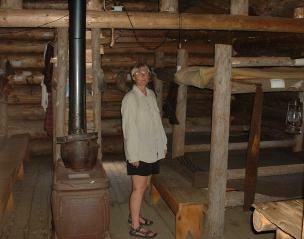 When she finished hiking one day in Patten, Maine we visited the Lumbermen's Museum. The Patten Lumbermen’s Museum presents a nostalgic view back into the bygone days of the “Great North Woods.” Located in these 9 buildings are artifacts of the past that show graphically the hard work and the hard life, as well as the leisure times of t men who perfected the “Art of Logging.” These men were so respected in their craft developed in the woods and on the rivers of Maine that they became known as the “Penobscot Tigers” when they pushed westward to New Hampshire and then on to Michigan and innesota, and even into the great Northwest. Washington and Oregon lumbering was jump started by “Penobscot Tigers.” They, indeed, lived and played hard! A seemingly endless stream of giant trucks loaded with pulp, pine, spruce and hard-woods roars down the Shin Pond Road, the lifeline of Maine's modem lumber industry. Beside this road, at the outskirts of Patten Village, in sharp and startling contrast, tands the Patten Lumbermen's Museum. Entering this tribute to a bygone era, time turns back 175 years. This display represents the very heart of the industry which contributed so significantly to the history and growth of the Pine Tree State. This is the road over which, for more than 175 years, thousands of woodsmen have passed with their horses and supplies to cut and haul or drive the millions of board feet of pine and spruce. 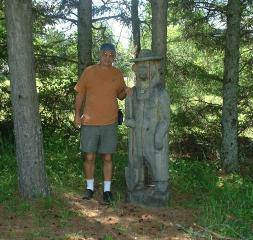 I even met "Smokie the Bear"
We have been seeing Darcy along the road every day. On Monday I looked for here to give her an awl so she could repair her pack. We didn't see her all day. When we returned to the RV there was a note that she had injured her foot and was staying in a bed and breakfast in Patten. She had gotten a bad blister that had taken off the skin on the ball of her foot. A doctor in town told here not to walk on it for a few days. On 7/3 we picked her up and we moved her to the campground in Houlton where we will be at starting on 7/6. She rode with me in the car while Judy hiked. 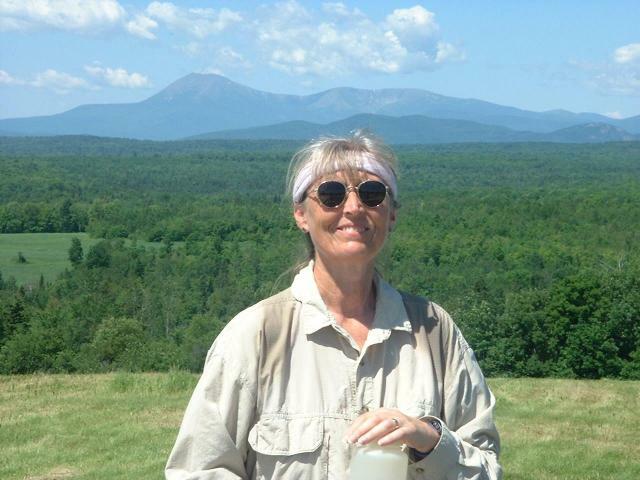 Darcy plans to return to hiking when Judy crosses into Canada in a few days. She'll have to pick-up the missed sections when she returns South. We're taking a day off on the 4th to visit with Chuck and Betty Wilson from Florida. They are on their way to New Foundland to hike. He hiked this trail in 1999.